Thanks for stopping by, I hope you enjoy the last days of the year. On this winter solstice in the southern hemisphere, and the summer solstice up north, now is a time of change. You are needed to save the world. Can you do it? Can you feel it? There’s a buzz in the air. Sometimes it’s positive and sometimes it’s negative, but undoubtedly, there’s a level of tangible electricity. Everyone I meet has a different opinion on the state of the world, but there is one common thread, and that is, that there is something changing. You’re right. There are a lot of things changing, and they have been for many years and now we are finally noticing the signs. We can connect with someone on the opposite side of the world without having met them. We can do this through breakthroughs in technology, which are available to more and more people on Earth. We can topple governments and create change at a grassroots level like never before. It is quite amazing. It is futuristic and very sci-fi. The future is here and if you think time is going fast now, it will only appear to be going faster as we expand in the space-time continuum. We are speeding up exponentially, driven by technology but when will our next spiritual evolutionary jump be? My secret to the evolution of human consciousness in our time on this planet is lavender oil. Essential oils represent a link to our past, and a beacon for the future, as they are simple agents of change. They are healers of our collective psyche, and panaceas of our individual worlds. A drop of lavender on your wrist, at the bottom of the shower, in the bath or cleaning your bench tops, could start a wave of solidarity, leading to a critical mass jump to the next level of evolution. How? The molecules within a drop of essential oil move through the spaces in our mind to our souls, allowing miracles to unfold. They slip through matter in waveform, and work their secret magic. My simplistic formula for our rise to the next level of humanity is one drop of lavender oil. Lavender will always be stylish! I know you’re reaching out to your fellow earth dwellers, on a one-to-one basis, exchanging information and love. We don’t need to be controlled by hierarchies of terror. Just love. And that’s what you are doing now if you are reading this, writing your own blog, running your own business, donating to charities, interacting on social media, or going out into your community in the flesh. This is a time of co-operation not competition. Essential oils can help us change focus in a matter of seconds, so when you get bogged down in life’s daily ups and downs, crack open that bottle of lavender oil and take a huge whiff. If everyone could experience a drop of lavender oil each day, we may be able to breakthrough the limitations we have come to believe actually exist. We allow our limitations to flourish with a collective agreement about how life “is”. Inhale one drop of lavender, exhale love, limitation, change, spiritual expansion and the power of oneness. Hello my natural beauties, I hope you are all well at this auspicious time of the solstice. I forgot a post last week as I was preparing to do another 2 live TV spots on TVSN, as a Brand Ambassador for Springfields Aromatherapy. I’m blaming the powerful blue moon solstice for my forgetfulness, and a little bit of nervous energy too. It was an early start in hair and makeup with my beautiful friend Jason, then off to the studio to do 2 live shows, each an hour long. Live TV is a bit nerve-wracking because there’s no saving grace. Anyway suddenly you’re on camera thinking “I hope I remember what to say’. Then its over and the world keeps turning. And that was the second show and it was all over, again. I’ve got 2 more days this year – in spring and summer (southern hemisphere). For a coat of your body use 3 teaspoons of carrier oil in a little dish and, add 7 – 8 drops of essential oil. It’s always best to patch test first, before you apply all over. ***** Always put the drops of essential oil into the bottle or dish first, then add the carrier oil. It gives the scents time to create a synergistic fusion. Remember to treat yourself first, then everyone will benefit. Check out my YouTube channel too, thanks. 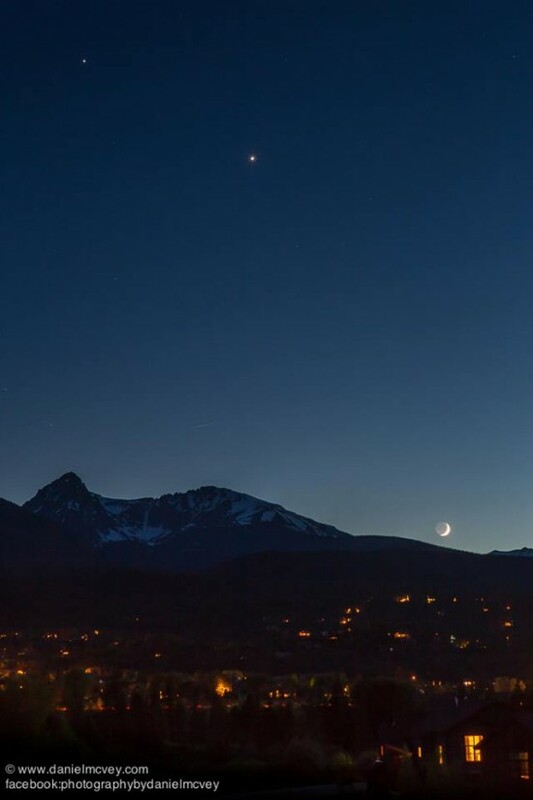 As I was wondering what to write about this week, and I noticed the bright stars and planets in the sky with a gorgeous crescent moon, I found out about the special connection Venus and Jupiter are having at the moment. But in my mind I kept stumbling on the word “Jupiter”, and using “juniper” instead. I have been known to accidentally ask for a juniper and tonic once or twice before in bars too! So I’m going to tell you how incorporating juniper essential into your life will give you an extra push, at this very auspicious time, wherever you live. 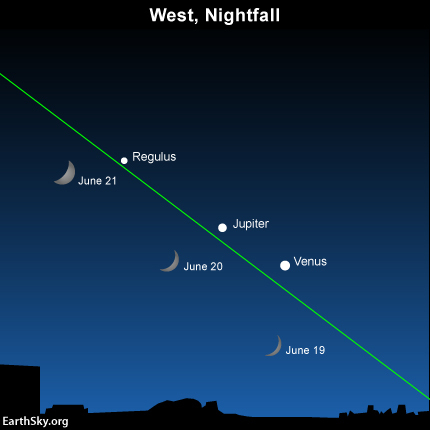 “On any night in June, 2015, look for the queen and king of planets – dazzling Venus and bold Jupiter – as these two worlds appear in your western sky first thing every nightfall. They’ll appear in your evening sky throughout June 2015, and they’ll be drawing closer together each evening! So whether you live north or south of the equator, or in equatorial countries, this planetary alignment is the same and its giving extra special powers to the Winter or Summer Solstice. I suppose it can be applied to us in winter too, and I did have a very social weekend – normally I’m by the heater for 3 months. 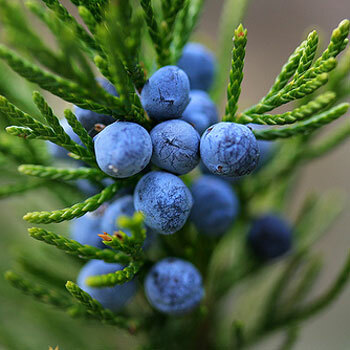 * Juniper is a great essential oil to help release extra fluid in the body including watery emotions. Maybe this means you need to shed any worries, sadness or concerns to take up the creative energy of the planetary alignment. * It’s an energetic cleanser for you and your space, to help you make room for the experiences you really want – maybe love? * It’s a light, bright sparkly scent, oozing sophistication. Use it around you to move your thought patterns from dark to light. * For those in the height of summer, it’s gin and tonics, fun in the sun, laughter and love, and reaping the rewards from seeds you planted last winter. You are able to enjoy the prosperous summer knowing winter is a long way off. * For those in the calm of winter, using juniper essential oil is a way to shed “stuff’ so you can be exact about what you’d like to come to fruition this summer. You are now on a steady rise to longer days, so commit to your desires NOW! 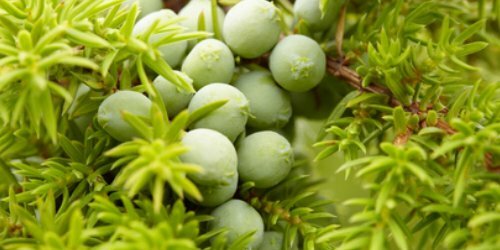 * For those in places very close to the equator, juniper oil can be a fresh addition to your routine, helping you gain better insight into your dreams for the future. Wherever you are, enjoy Jupiter and Venus, the solstice and the gorgeous oil of juniper.